Dr. Culley’s personal testimony. The world of academia posed daunting challenges to faith in Christ and a belief in the authenticity of the Bible. With honest vulnerability, learn of the events that pushed Jerry away from the truth…and the TRUTH that drew him back to solid faith! 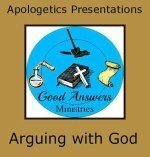 All Good Answers Ministries Apologetics Presentations are available now on YouTube for smoothest delivery of the PowerPoint slides and voice-over narration. If you prefer to have a printed transcript of the narration, email Dr. Culley directly at drjerryc4@yahoo.com. Click here for Arguing with God.